For some time now Optimum Nutrition Gold Standard 100% Whey has been regarded as one of the best powders on the market winning many awards along the way to say so. Here at tpxmuscle we wanted a closer look to see what all the hype is about. Looking first at the important factor which is protein content you will not be dissapointed. 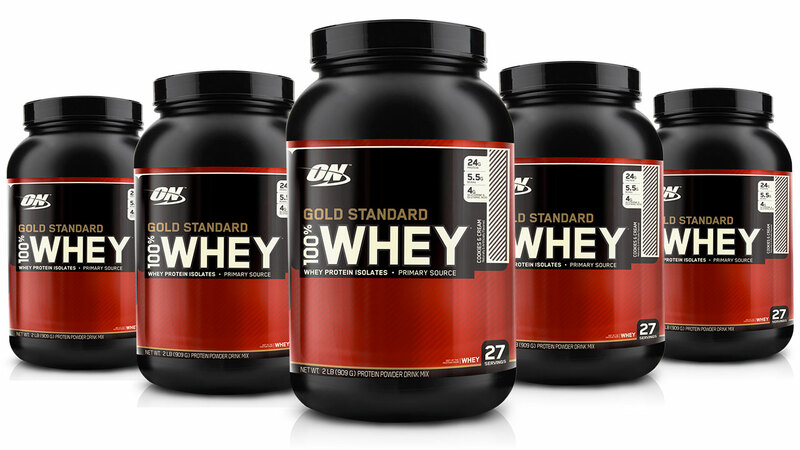 ON gold standard whey offers an impressive 24g of protein per 30 g serving. This comes with little of those additives that come with other powders. This means the product contains only 1g of fat, 1g of sugar and 3g of carbs per serving. For a protein powder this alone would make it a fairly reasonable product. However, ON have added fast acting hydrowhey peptides which allow the body to breakdown and absorb the protein more easily. Absorption is also improved by containing lactase and aminogen digestive enzymes. This science you don’t need to know about. It is just enough to know that this will improve absorption meaning your body will get that full 24g dose of protein. ON Gold Standard 100% whey also contains 5.5g of BCAA’s and 4g of muscle building glutamine per scoop. This will help your body stay in an anabolic state and improve your body’s recovery between training session. If you desire more BCAA’s or glutamine you can add some to your Gold Standard Whey shake for that added intensity. Gold Standard 100% Whey is instantized meaning it mixes easily with water or milk. I personally always use a shaker to improve mixability but it does mix easily in a glass with a spoon unlike some other powders. Using a shaker makes it easier to take to work or the gym. Add your water to the shaker and one scoop of whey and you have the immediate hit your body needs after an intense session. The range of flavors offered by ON again makes it a superior choice. I personally always buy strawberry when buying any shake. Its usually the safest option and gives the ability to compare all products on a level playing field. However if you are bored of the usual banana, strawberry, chocolate you can go for orange or even capucino. All in all Optimum Nutrition Gold Standard 100% Whey is as good as they say it is. Despite all the added benefits of the BCAA’s and glutamine it is still competeively priced at $52.99 for a 5lb tub.